There are dozens of different measuring tools that home chefs and bakers use from week to week. Measuring cups, spoons, pitches, and more each have their specific purposes. 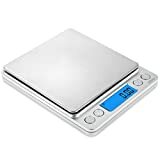 Because of this, many people might not think that they need a kitchen scale, but anyone who has used a digital scale for baking or cooking will tell you how it completely changes just about everything. The best kitchen scales make cooking faster, simpler, and more intuitive. 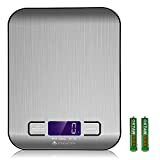 And the best digital kitchen scale of 2018 for your family can be found on this list. 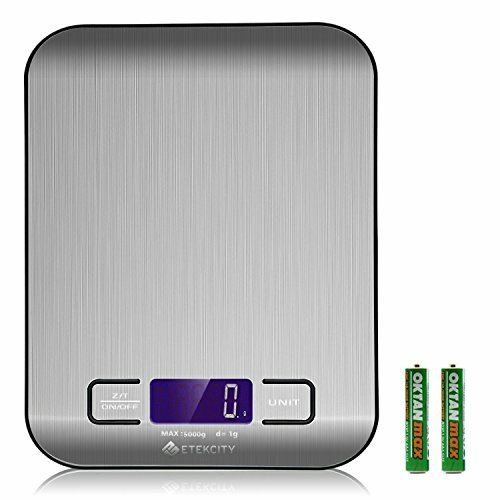 The inexpensive Etekcity Digital Kitchen Scale is a very popular product that is known for its small size, sleek design, and super user-friendly functionality. If you want to choose what many consider to be a top-of-the-line product, this might be the scale for you. 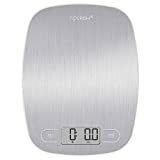 This digital kitchen scale from Etekcity might be a great choice for anyone who is new to the world of kitchen scales because it is so easy to use. The learning curve is very easy to follow, and you probably won't even need the user manual to understand how to use this appliance. The scale can measure pounds, ounces, grams, or milliliters, and resetting it to zero is as simple as pressing the tare button. This means you can measure ingredients plain or put them in the container of your choice for an accurate reading. The scale itself is accurate to one gram precision, though it only starts to read if something is heavier than three grams. This means you won't be able to measure small amounts of powder, but this should not be a big problem for most users. The backlight on the LCD screen only stays on for ten seconds which saves battery life but can be hard to read if you don’t see it quickly. 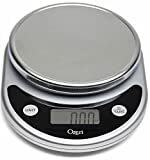 The Ozeri Pronto kitchen scale is a competitive alternative to the Etekcity scale which also comes at an affordable price with accurate readings and a sleek design. 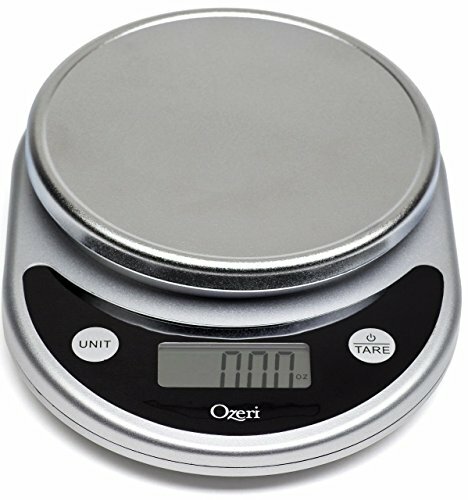 Let’s dig into our investigation of the Ozeri Pronto Digital Kitchen and Food Scale. The first thing that stands out about this scale is the many different colors that it is available in. Each bold color is sure to fit a different kitchen, so you can find the perfect item for your decor without worrying about finding cabinet space for the scale if it doesn’t match. Another great thing about the scale is its conversion functionality. The scale reads grams, pounds, pounds, and ounces, just ounces, and milliliters. Switching between these measurements is as simple as touching a button, so you will have all the information you need in no time. One problem that you may have with this particular scale is the very small size. If you need to weigh something in a casserole dish or on a dinner plate, the item will obstruct your view of the screen, making it all but impossible to use. Like all scales, this scale has a margin of error. This scale has a respectable margin of error of around two grams. This would not affect everyday cooking but might affect more precise baking. If you are someone who needs the utmost of accuracy, you're better off checking out the next review on this list. This choice brand scale by AMIR is a unique kitchen scale that can do more than just measure your ingredients to a 0.01-gram accuracy – it can also count! This scale is the right choice for those who want the best accuracy to the smallest degree. Many people who have tried kitchen scales before want to use something with more precision and accuracy when they buy their next scale. They might be very satisfied with a scale like the AMIR Digital Kitchen scale, which accurately measures everything from 0.01 to 500 grams. 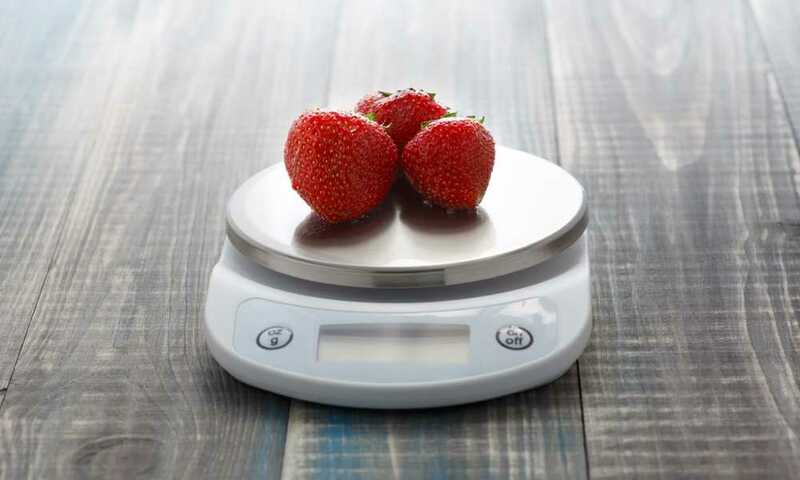 Another feature worth exploring with this model is the counting function, which helps it stand out as one of the best digital kitchen scale options. Once you measure the weight of one item, you can have the scale count a larger number of the items based on their weight. Since this scale is so sensitive, it is also easily thrown out of whack. You may need to work on calibrating it often and keeping everything off of it when not in use will be necessary to not mess up the sensors. The scale is rather delicate. Stylish Design & Space Saver: Minimalistic and elegant design, the food scale's mini and compact size (Product Dimensions: 4" x 5" x 3/4". Platform Dimensions: 4"x4") takes up minimal space on your desk, makes it a pro pocket scale makes it easy for carrying. A similar model to the Etekcity Digital Kitchen Scale, this option from Greater Goods comes in at a lower price with slightly fewer features, making it a good budget option for at-home chefs. The Greater Goods kitchen scale is a cute, small scale that is made of a stainless steel top that is a scratch resistant surface. If you plan to keep your scale on the counter, this might be a nice touch. You don’t have to worry about it looking old or ragged thanks to this feature. The buttons on this particular model (in comparison to the plastic version by Greater Goods) are much more functional. They register with feedback whenever you click, and they feel sturdier. Additionally, it’s easy to switch between different measurement conversions because of the intuitive layout. Like other scales that measure in one gram increments, this scale doesn’t seem to be able to pick up any weight underneath about three to five grams. While this won’t be an issue in some recipes, it could cause problems if you like to be very detailed in your preparations. Another great digital scale option from Etekcity, this model has a detachable bowl which sets it apart from many of the digital scales on the kitchen appliance market. 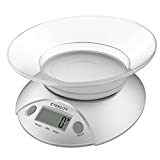 The detachable bowl that can be used for super quick and easy measuring is the standout feature for this digital kitchen scale. The scale itself will auto-zero when you use the bowl, so you don’t even have to tare the device while measuring this way. Additionally, the bowl being detachable makes this model simple to store. The bowl can be removed and flipped upside down on top of the scale to save space. For those who don’t have much space to spare, that will be incredibly useful. All that being said, the detachable bowl is made of plastic and is not as durable as some might like it to be. If used with acidic ingredients such as lime or lemon juice, you may find that it burns or degrades the plastic, rendering it permanently damaged. Still, the scale is very simple to use and can switch between wet and dry measurements with ease, making it a favorite of many home chefs. Among the best digital kitchen scales, the Etekcity Digital Kitchen Scale stands out as the top product for its great design, accurate readings, and easy-to-operate control system. If you want something with unique functions at a similar price, you may want to consider the AMIR Digital Kitchen Scale which can give more precise readings down to the 0.01-gram measurement. It can even count objects for you. The bottom line is that any of these digital kitchen scales will do a standout job of helping you make a more delicious dinner for your family or guests. Plus, you’ll be able to do it more quickly thanks to the time-saving method of using a scale to measure your ingredients.